The key feature of future mobile communication systems is the ability to deliver wideband and high bit-rate multimedia services alongside the traditional radio services such as voice, messaging and slow rate data. The broad range of services expected to be supported can be divided into different Quality of Service (QoS) classes. However, the provision of such mobile multimedia services under QoS guarantees will not be possible without a utilization of the air interface resources by means of Radio Resource Management (RRM) strategies that ensure the target QoS, the planned coverage area and that offer a high system capacity. Under this framework, this book focuses on the RRM concepts, including the theoretical background that serves as a basis for the description of specific RRM algorithms. The RRM problem for UMTS is presented, and more specifically, for the FDD mode, which is based on a WCDMA scheme. 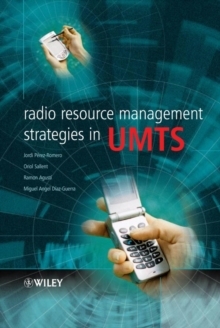 More specifically, the different aspects that are covered are: the mobile communications sector and UMTS, including the evolution towards 4G systems, with an overview of the QoS concept which is key for the definition of RRM strategies; a detailed description of the radio interface in UMTS, as the basis for the implementation of RRM strategies; the fundamental concepts related with the development of RRM strategies in WCDMA networks; particular RRM algorithms in a variety of scenarios, trying to identify the key parameters and factors that influence their performance; and, the evolution of UMTS towards Beyond 3G systems and the concept of Common RRM in heterogeneous networks with the aid of some algorithm examples. This comprehensive title is essential reading for engineers and managers in radio engineering departments of UMTS network operators and UMTS equipment manufacturers. It will also prove insightful to researchers in the field of 3G and Beyond 3G systems and academics in any of these areas.